Author(s): Mizue Terai, Takami Sato. Department of Medical Oncology, Thomas Jefferson University, 1015 Walnut Street, Suite 1024, Philadelphia, PA 19107, USA. 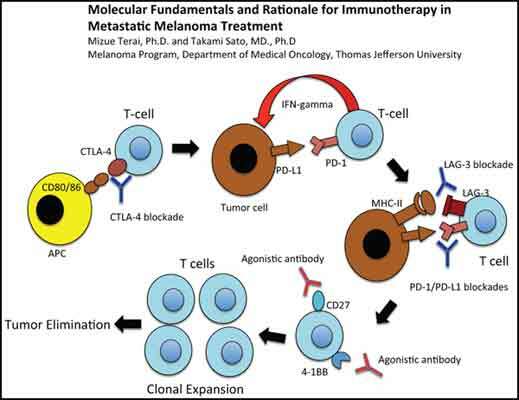 Clinical application of immune checkpoint blockades has dramatically changed the landscape of cancer immunotherapy, especially in the field of metastatic melanoma. For the first time in the history of treatment of melanoma, immunotherapies using immune checkpoint blockades such as anti-Cytotoxic T-Lymphocyte Antigen-4 (CTLA-4) and Program Death-1 (PD-1) antibodies have consistently shown regression of metastatic tumors with survival benefit. However, the treatment of metastatic melanoma with immune checkpoint blockades has also brought new scientific and clinical challenges to treating physicians and clinical investigators. Such new challenges include: (1) how should we manage/ minimize serious immune-related adverse events without sacrificing anti-cancer effects?, (2) how should we choose one immune checkpoint blockade over others and in what sequence?, (3) how should we combine the immune checkpoint blockade with other cancer treatments such as chemotherapy, radiotherapy and signal blockades?, and (4) how can we predict clinical response with new immunological agents? In this review, we provide an overview of the molecular basis of new immunotherapies for metastatic melanoma and discussed potential strategies to improve the treatment outcomes using immune checkpoint blockades alone or in combination with various therapeutic modalities. Keywords: Melanoma, immunotherapy, CTLA-4, PD-1, PD-L1. Affiliation:Department of Medical Oncology, Thomas Jefferson University, 1015 Walnut Street, Suite 1024, Philadelphia, PA 19107, USA. Keywords:Melanoma, immunotherapy, CTLA-4, PD-1, PD-L1. Abstract:Clinical application of immune checkpoint blockades has dramatically changed the landscape of cancer immunotherapy, especially in the field of metastatic melanoma. For the first time in the history of treatment of melanoma, immunotherapies using immune checkpoint blockades such as anti-Cytotoxic T-Lymphocyte Antigen-4 (CTLA-4) and Program Death-1 (PD-1) antibodies have consistently shown regression of metastatic tumors with survival benefit. However, the treatment of metastatic melanoma with immune checkpoint blockades has also brought new scientific and clinical challenges to treating physicians and clinical investigators. Such new challenges include: (1) how should we manage/ minimize serious immune-related adverse events without sacrificing anti-cancer effects?, (2) how should we choose one immune checkpoint blockade over others and in what sequence?, (3) how should we combine the immune checkpoint blockade with other cancer treatments such as chemotherapy, radiotherapy and signal blockades?, and (4) how can we predict clinical response with new immunological agents? In this review, we provide an overview of the molecular basis of new immunotherapies for metastatic melanoma and discussed potential strategies to improve the treatment outcomes using immune checkpoint blockades alone or in combination with various therapeutic modalities. Left-Right Asymmetry in Embryonic Development and Breast Cancer: Common Molecular Determinants?